With all of the uncertainty of our state budget and with the state’s financial situation, bills are passing slowly through committees. There have been a few hearings but nothing that we have written testimony on. I am wondering how many bills that concern funding has been held back due to concerns with possible cuts to municipal grants and state services. One bill that we have been monitoring is HJ 99 – RESOLUTION PROPOSING AN AMENDMENT TO THE STATE CONSTITUTION TO PROTECT THE FUNDING OF PROGRAMS THROUGH THE COMMUNITY INVESTMENT ACCOUNT. As the title indicates, this bill proposes an amendment to the Constitution which would create a separate account for the Community Investment Funds. Money in this fund would come from the existing surcharge imposed on real estate filings. These funds would be divided by and locked for use by designated agencies and programs and could not be accessed for other needs. The Community Investment Act (CIA) came into existence in 2005. The CIA is a dedicated fund that supports four sectors, Agriculture, Open Space Conservation, Affordable Housing and Historic Preservation. Funding for these programs originates from a $40.00 surcharge on real estate recording fees. The CIA program has been generating up to $25 million per year with the monies being placed in a dedicated fund. A significate portion of Department of Agriculture programs are funded through the CIA funds. This CIA has been extremely successful directing more than $133 million towards saving hundreds of acres of farmlands, restoring historic buildings, supporting agricultural programs and affordable housing. This program has touched almost all towns in this state. The last State budget transferred about half of the unspent CIA monies into the general fund. They also proposed that any new funds as a result of the real estate surcharged also be placed into the general fund. The Legislators did not approve that proposal last session. This proposed amendment has very strong support by multiple agricultural groups, including the Grange. Gordon Gibson and I recently attended a rally at the Capitol along with these other groups supporting this amendment. We were greeted by a constituency of legislators who spoke in support of this amendment. 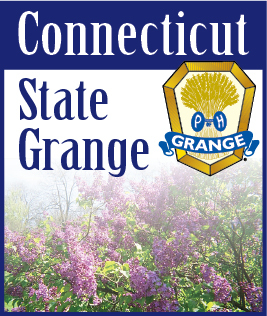 I encourage all Grangers and Granges to contact their legislators in support of HJ99. You can locate your legislator and how to contact them by going to the State General Assembly website - http://www.cga.ct.gov/. An example of some of the programs that will be affected are the Agricultural Sustainability Account (Dairy Support Program), Farmland Preservation, Ag Viability and Farm Transition Grant programs, Connecticut Grown program, CT Farmlink, Seafood Advisory Counsel, CT Farm Wine Development Council and the CT Food Policy Council. If the funding is eliminated, these programs and more will disappear.